Michael Robin wrestles with the Huskies. Throughout 2016, members of the university communications team are working out with our Huskies to see what it takes to be a Huskie student athlete. In this edition—Huskie wrestling. Michael Robin, I'm the research communications specialist. I write stories about science and provide related strategy and support. What's your experience in this sport? I wrestled a bit in high school (early 1980s) and have done a little jujitsu. I mainly train in kickboxing three times a week. What did the Huskies have you do? The team had me in for what is called a "taper" day, which is what they do right before a competition (in this case CIS nationals). The idea is to sweat a bit (okay, a lot) before final weigh-ins and put a final fine edge on their skills. We started with an impromptu game of indoor soccer, then warmed up some more with laps, calisthenics like jumping jacks and leg swings, plus a lot of different gymnastic moves such as flips, cartwheels, front and back rolls. Then we grappled, interspersed with active rest (more laps) and the occasional break for instructions from the coach or a sip of water. I'm glad I visited on a taper day, because we did a single hour and a half workout, rather than the usual routine of an hour in the morning and another couple hours after classes. I thought I was in pretty good shape, but the Huskies women and men are at a whole different level. You can watch collegiate-level sports and admire the athletes, but once you've been on the mat against a Huskie wrestler, you truly appreciate and respect their power, speed and skill. To be a Huskie demands supreme dedication and focus— they don't waste time, because they have no time to waste (for example, they wrote exams while on the road at CIS). 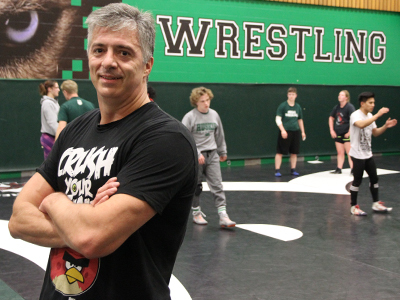 This pays off in their academic lives: the best wrestlers tend to be the best students. They're also encouraged to do community volunteer work on top of everything else. The team spends so much time together that they are friends, social life and extended family all wrapped up into one. I was inspired by this truly exceptional bunch of people and grateful for the opportunity to work out with them. I found myself wishing I was 30 years younger so I could take a shot at joining them—if I was good enough!